You don’t need choreographed dancers or hired actors to be an effective guerrilla marketer–big creativity, high energy, and willingness to take a few risks can compensate for a small marketing budget when it comes to promoting your business. Sometimes these techniques even trump traditional marketing. Guerrilla marketing works so well that even companies with the deepest pockets, like Sony and Coca-Cola, have successfully used guerrilla marketing techniques. And despite the name, you don’t need a gorilla to be a guerrilla marketer—maybe just some squirrels (more about that in a second). Simply put, guerrilla marketing is marketing outside the box. Or, in the case of Coca-Cola’s “Happiness Machine,” outside of the bottle. In their clever campaign, the brand installed machines around the world that delivered more than just a Coke. The vending machines patrons were surprised to receive flowers, pizza, and even calls to loved ones. Maybe you don’t have Coke’s budget for guerrilla marketing, but a stunt like this can be pulled off on a small budget. Coke only set up their actual “Happiness Machine” antics a few times, captured them on film, and released the videos on platforms like YouTube and Twitter. Now, their guerrilla marketing technique has amplified the value of their traditional marketing techniques—in this case, millions of views online. For the smaller business, know that guerrilla marketing goes beyond the half-page blurb in the local paper and the ad banner on the side of a webpage. This tactic actively goes out and demands your attention, in today’s world where people are paying less and less attention to the traditional forms of advertising. So, while your small marketing budget may seem like a limiting factor at first, if you’re willing to take a few risks, you may even find yourself at an advantage. Just your average day at 2015 SXSW, right? A few squirrels reading books—no big deal. It’s a common misconception to think that all guerrilla marketing campaigns consist of flash mobs, rebel graffiti artists, or acrobats juggling your product in the park. Those things might not hurt, but they are pretty drastic. 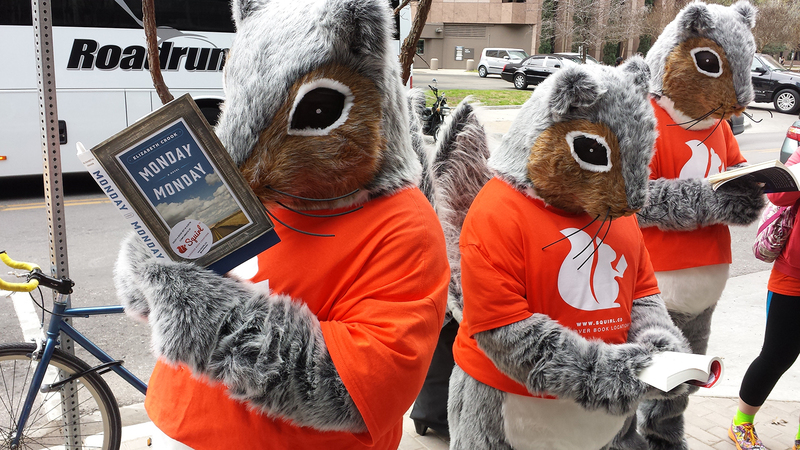 Take this campaign as an example: here are a few squirrels reading books at 2015’s SXSW music festival. Why? They are promoting Squirl, an app that uses your location to suggest books based on your proximity. If a scene in a classic book happened near you, the location-based book discovery app lets you know. This company took advantage of two types of guerrilla marketing—ambush marketing and street marketing. It would be easy to hand out t-shirts on a busy street, but this company took advantage of an ongoing event and rode it’s coattails of attraction. Thus, “ambushing” the event, as it was not affiliated with their company, Squirl used an eye-catching scenario on the street to capture the attention of their audience. The only telling sign of their company was the brightly colored, branded t-shirts with their URL on the front. Brilliant! Ambient marketing can be another useful tool in the guerrilla marketer’s arsenal. Companies have used the environments of bus stops, landscaping, light posts, even the hand dryers in public restrooms as creative billboards. But when you adapt those environments to not only fit your product promotion, but also your message, you create prime guerrilla marketing! What do you do, however, if you don’t have access environment-adapting resources? This diet pill manufacturer adapted their drawstring tote bag’s form to fit the message of their product. Cinch the bag, cinch your waist—it’s that easy. Do the same with your company’s swag. Sometimes, putting your logo or brand on your swag isn’t enough. A burst of inspiration can sometimes strike, and suddenly your business card, bumper stickers, or t-shirts become more than just a promo tool. For something as simple as a t-shirt, good timing and a good idea can couple into a moment of brilliance. 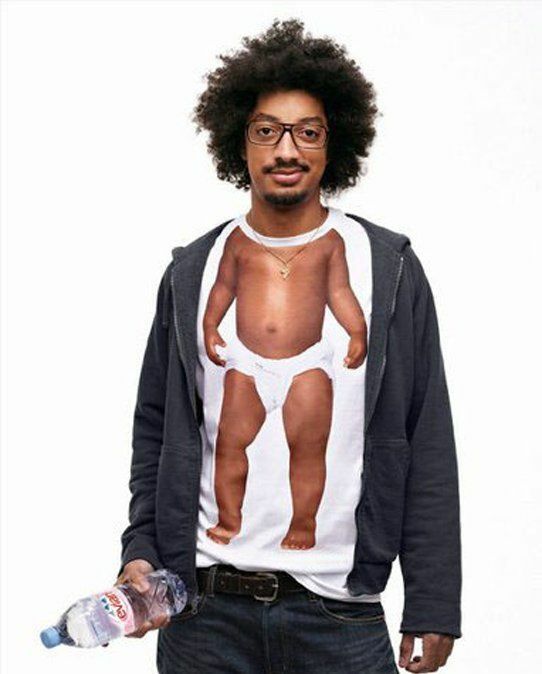 The t-shirt shown above is from Evian’s “Live Young” campaign. It’s simple, attention-grabbing, and gets the point across in a unique and clever way. Does the T of the t-shirt fit your brand name? What about the scoop of the neck? Could that play into your product’s purpose or logo? Will splitting the message between the front and back of your t-shirt make passersby curious? Leave them hanging with mystery—get them to pursue that URL. Are your colors bright and bold enough? Is the font large enough? You want the wearers to be so content with fit, style, and comfort that they forget they are walking billboards. So, if your image, logo, or message isn’t large enough, you might miss your chance to grab their attention. Think Oscar Meyer’s Wienermobile, or the Goodyear blimp—these things work because of high visibility. Remember, your greatest asset is someone’s attention. Whether you have them captive for a meeting in a board room, or in the two seconds it takes to pass your table at a trade show, attention is the commodity and your creativity is the currency. So how much are you worth?